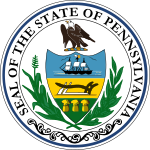 The Pennsylvania gubernatorial election of 1811 occurred on November 5, 1811. Incumbent Democratic-Republican governor Simon Snyder won re-election over Federalist candidate William Tilghman, the Chief Justice of the Pennsylvania Supreme Court, by a wide margin. Two of the major policy goals on which Snyder campaigned were increasing spending for infrastructural upgrades and authorizing the transfer of governmental operations from Lancaster to Harrisburg. ^ "Pennsylvania Gubernatorial Election Returns 1811". Journal of the Senate of the Commonwealth of Pennsylvania. Retrieved 3 July 2012. This page was last edited on 17 January 2019, at 01:37 (UTC).